Or is it a job description? Taxi driver, short order cook, nurse, laundry service, counselor, nightmare comforter, supporter, cheerleader? While ‘thank-you’ will never ever be enough to voice our appreciation for all our Mom’s do for us….here’s my feeble attempt at doing just that! I hope you enjoy! Here are some of my favorite things my Mom taught me that still ring true today, whether in my family life or in business. ~ Have more faith than fear. My Mom, while not perfect, really tried/try’s to walk her journey of Faith out. I don’t remember any morning growing up that didn’t start with her doing a devotion and talking to God. This was regardless of good or bad times our family was having. How this still inspires and challenges me. Taking a step of Faith, knowing that someone is there to catch you is never a bad idea……even if you fall you’ve learned something you’d never otherwise learned! Mom and I enjoying nature! ~ Appreciate Nature and all of Creation. ~ Show kindness, no matter how small it may seem. My Mom was always the first to reach out when someone was hurting. Whether it was baking a casserole or driving kids where they needed to go she was always willing to help out. She taught us to think of others first. Even when we didn’t have much we learned to give first! ~ Hold tight to your family, through good and bad. These are the folks that will be there through good, bad and otherwise. No one has the perfect family of course, but we all have the people with us to teach us the lessons we need to learn. The folks that know us at our best and our worst and still love us anyway! ~ Learn how to do it on your own. 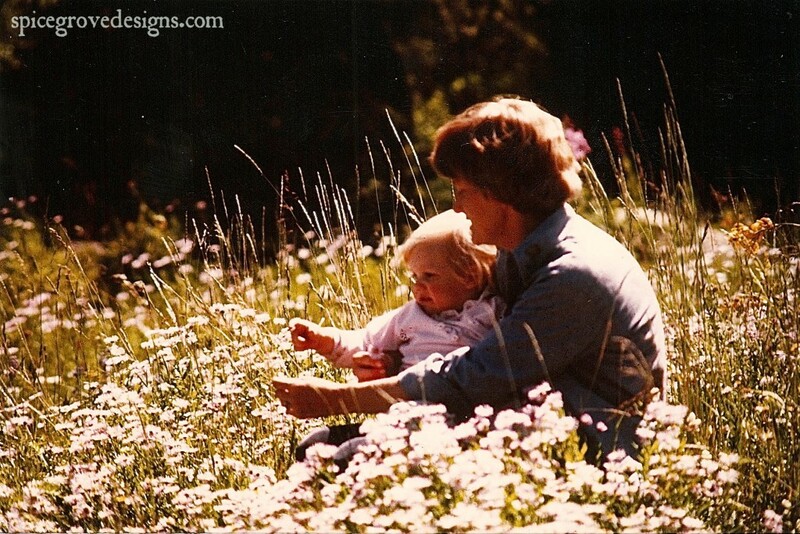 My Mom was great at encouraging us to try things on our own – to make mistakes while thinking for ourselves. With trial and error came creativity, thinking out of the box, and learning to deal with failure and success. ~ Follow your dreams, they will lead to an amazing life! My parents both encouraged us to follow dreams that fueled our passions. Now that I’m a Mom too, I can only imagine how it tugged at my Mom’s heart when I announced that I had decided on being a music major in college, yet she rarely voiced her concerns, but let me find out what chasing that dream meant. 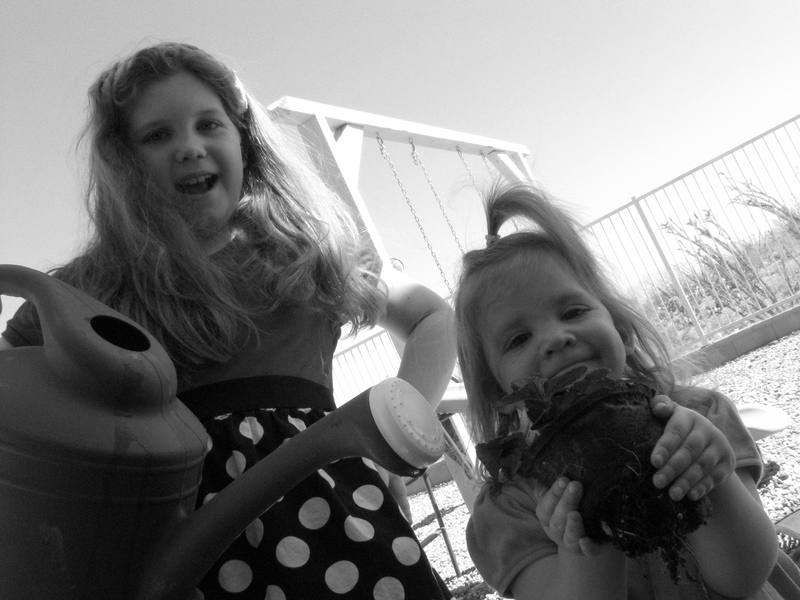 I love you Mom…..and I pray that I can pass on these lessons to our girls as they grow up…. 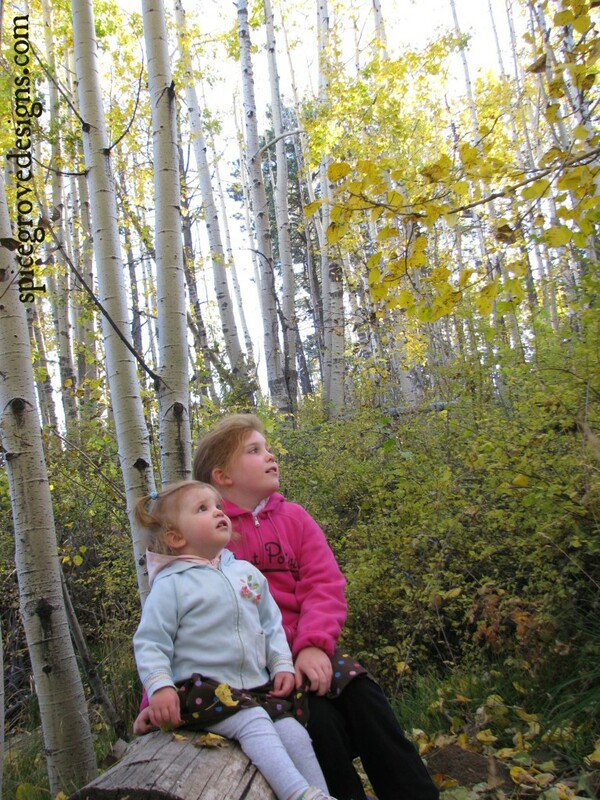 Our girls in my beloved Aspen trees…. 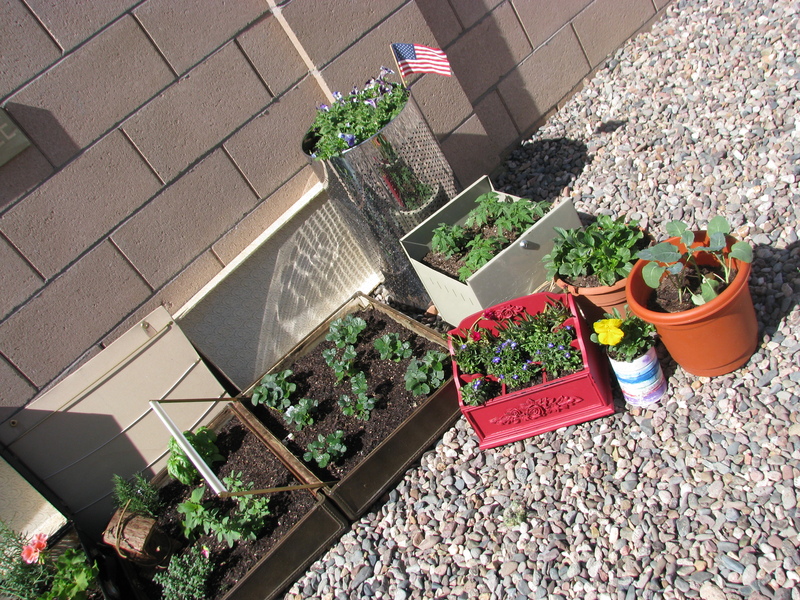 Our recycled garden! A DIY tutorial! 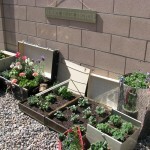 Here we’ll go through our easy steps of how we created a stunning garden in no time and with minimal expense! 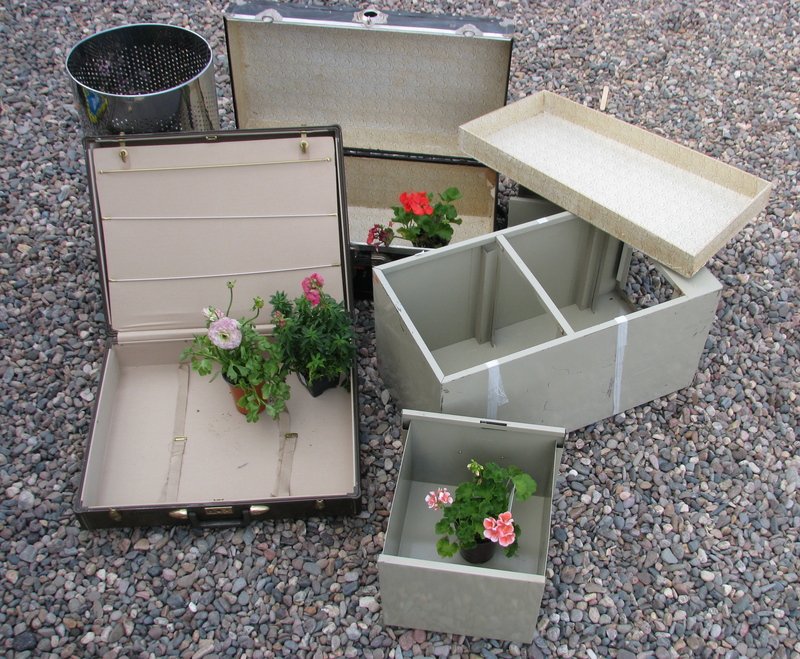 Decide what ‘look’ you are going for and find pieces/containers that match your style and plants you’ll be planting. Here we were looking for pieces that worked together, but had an old -time feel to them. (I let my girls pick some of the pieces out so it’s a bit more eclectic than I had envisioned! But I love how it turned out! 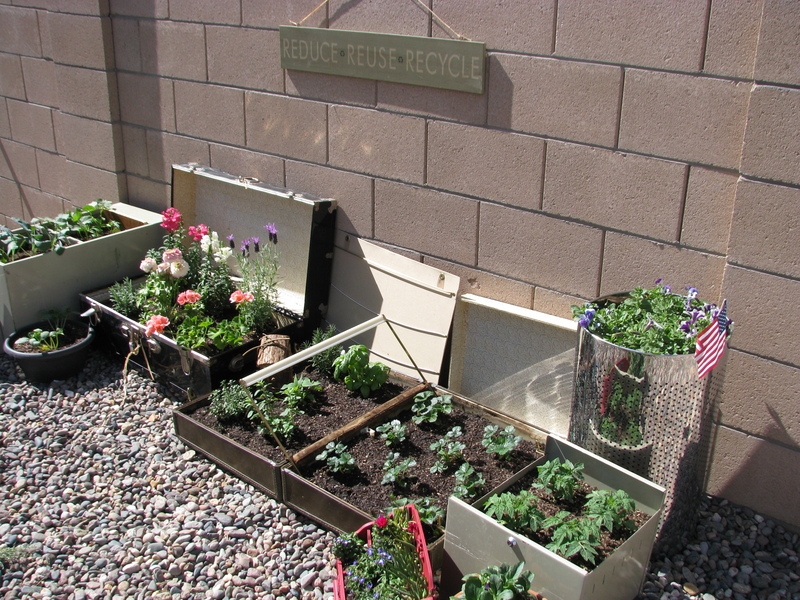 We even found the ‘Reduce, Recycle, Reuse’ sign at a thrift store and added that to the garden! 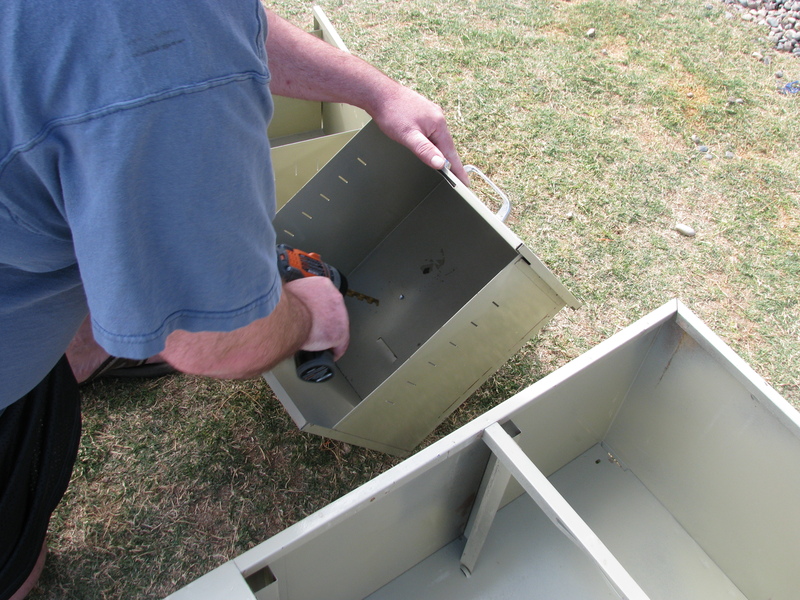 We used a drill and dremel to accomplish this as we had a mix of metal and wood containers to drill. My sweet Hubby was so kind to help us with this task! Fill your container with good soil. I used an organic, non GMO soil made locally since we are growing edible yummies in the garden and it makes me so happy knowing we’ll have healthy, ‘good for us’ food in a bit! 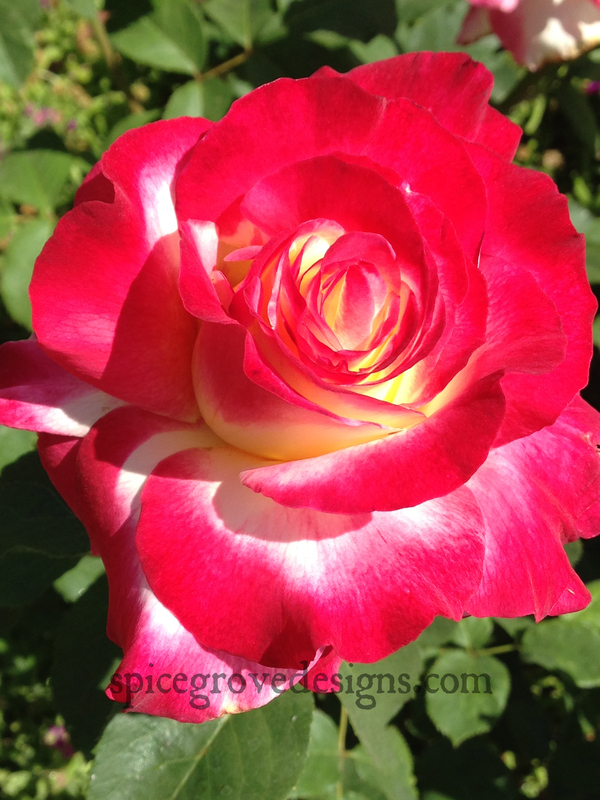 Plant your seeds or plants in your new beautiful gardens! We cheated this year and bought many of our plants already blooming or started since I was a bit late with this project this year! 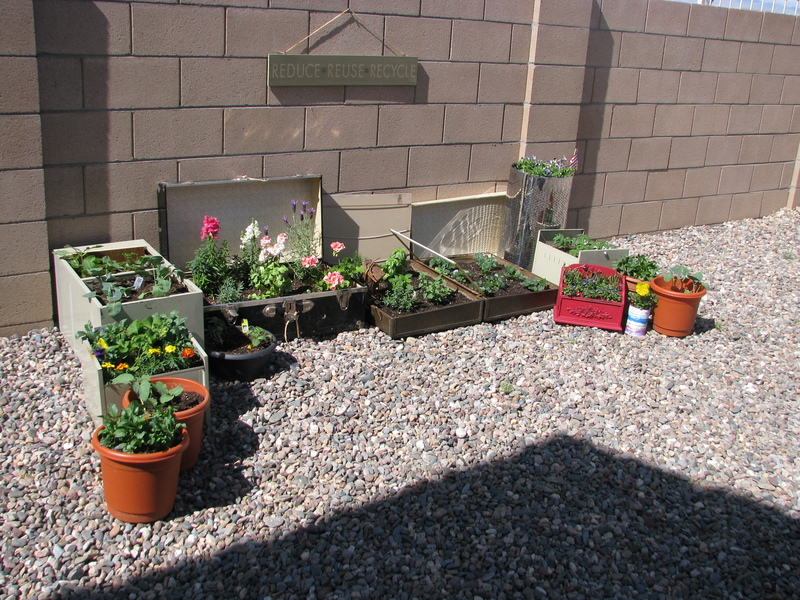 (Mental note….start in Feb. in the desert as the heat will be on us by late May!) But we did pick out some veggie seeds that will be going into the wooden munition boxes this week so I’ll have pictures of that soon! Pictured below are some of the flowers that the girls and I chose. 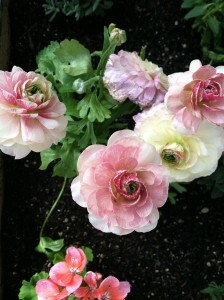 The gorgeous footlocker features sweet snapdragons, a geranium, 2 kinds of lavender and my favorite little ranunculus. 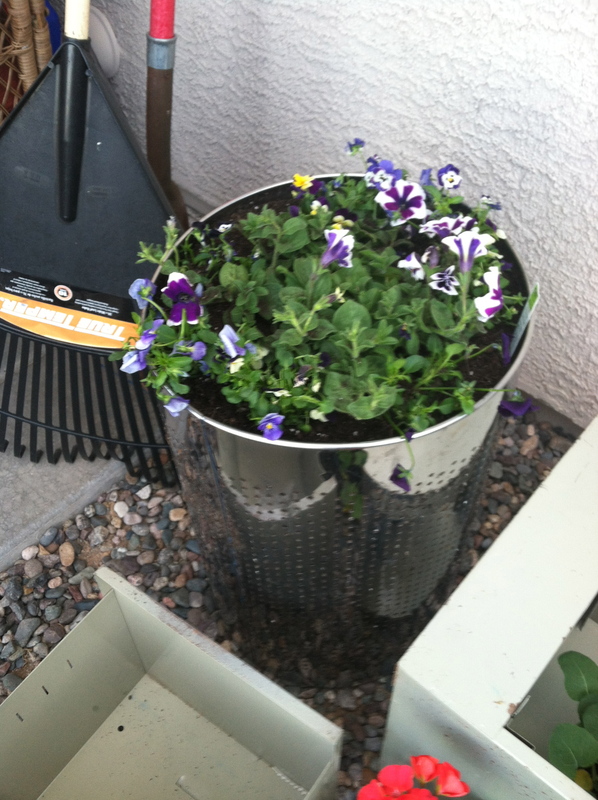 The tall metal trash can is filled to the brim with a petunia and sweet little viola’s and johnny jump up’s. 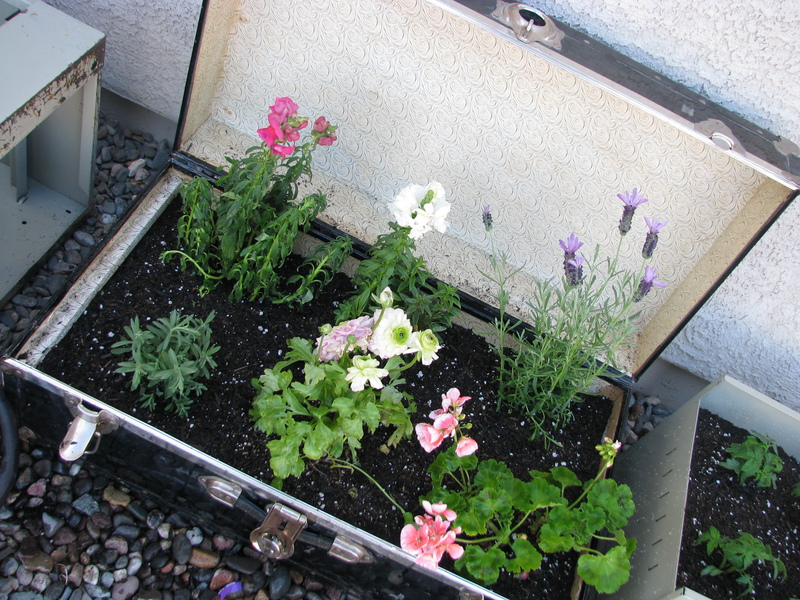 The vintage suitcase that I fell in love with now holds a strawberry patch on one side and a herb garden on the other! 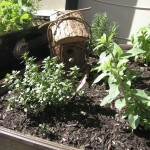 (Can you smell the delicious lemon thyme and pineapple sage from there??) 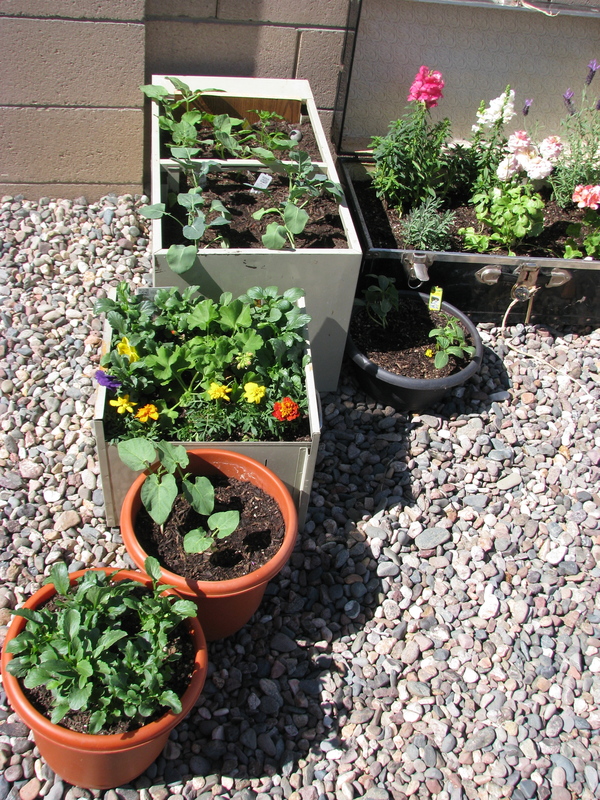 The file cabinets and various recycled pots hold broccoli, yellow and orange peppers, sweet peas, tomatoes, and cucumbers. (Yum!) My youngest just loves the orange marigolds so we mixed those in with the rest of the pansies, violas and johnny jump up’s that we had left. 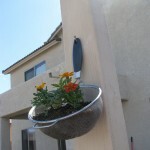 The colander holds 2 adorable marigolds that were so easy and fun to plant. 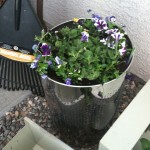 (Note of warning – don’t forget to water this one daily as the water drains so very well!!) 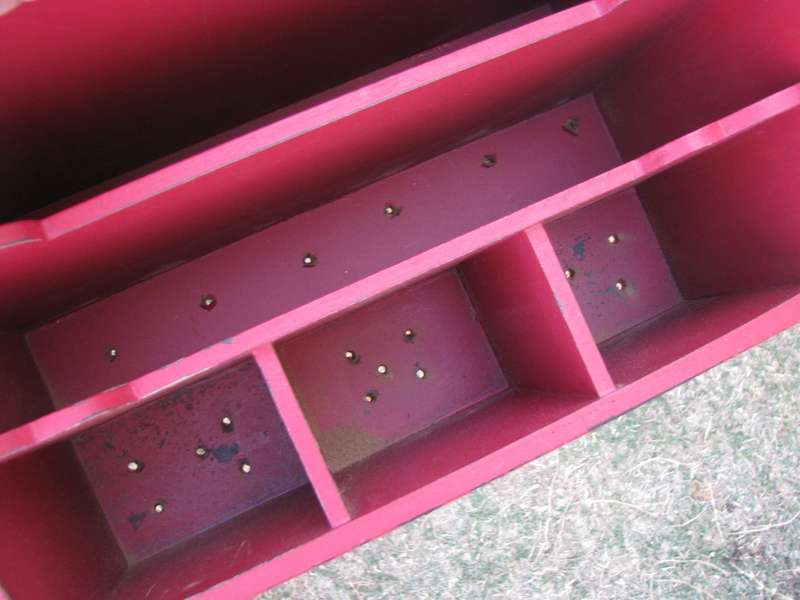 One of my favorites was the up-cycled letter holder my Mother in law so sweetly gave me! (Hopefully she won’t mind this use of it!!) 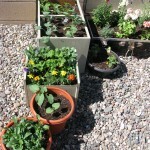 We put some ice plants and sweet little lobelia in there and it is just bursting with happiness! 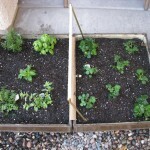 The charm of these types of ‘container’ gardens is that you can make it meet your exact design preferences. 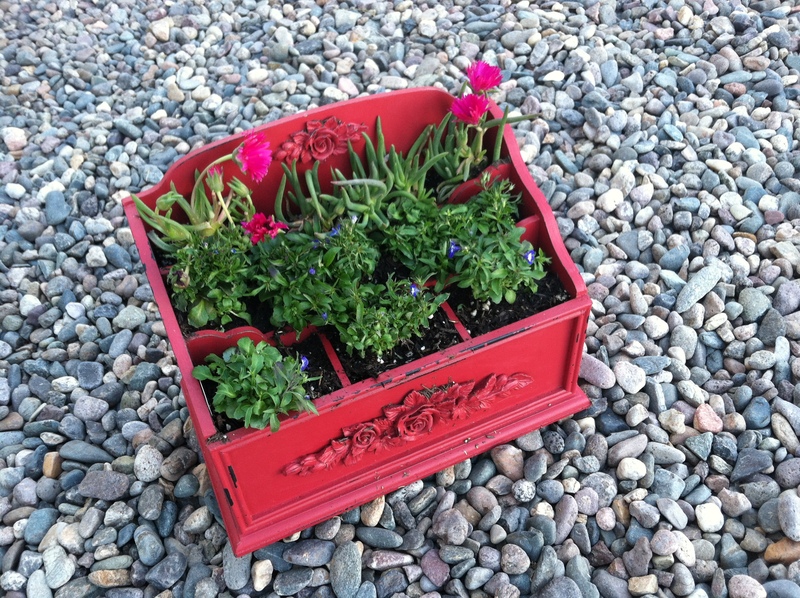 If you love rustic designs, you can easily pick out/find older rustic looking containers to plant your garden in. 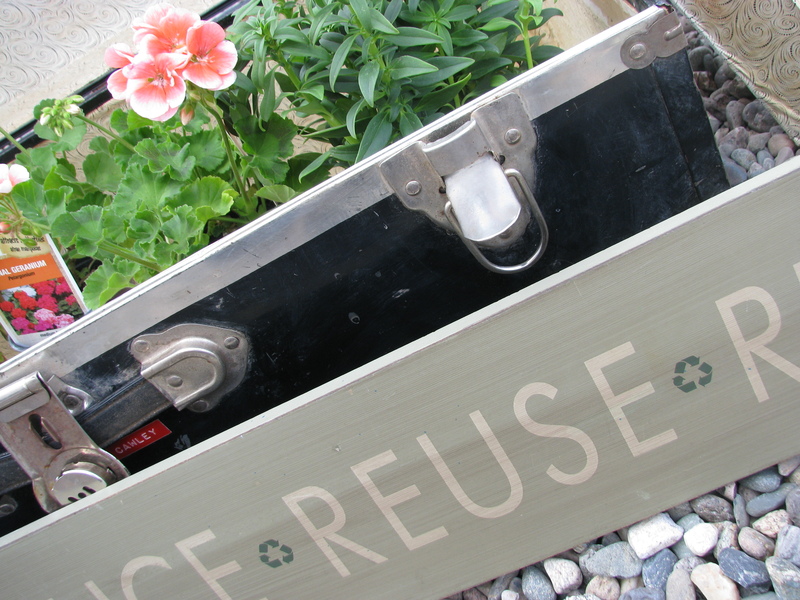 Find old wooden signs and make your own planters from that. How about an old rusty tire rim? 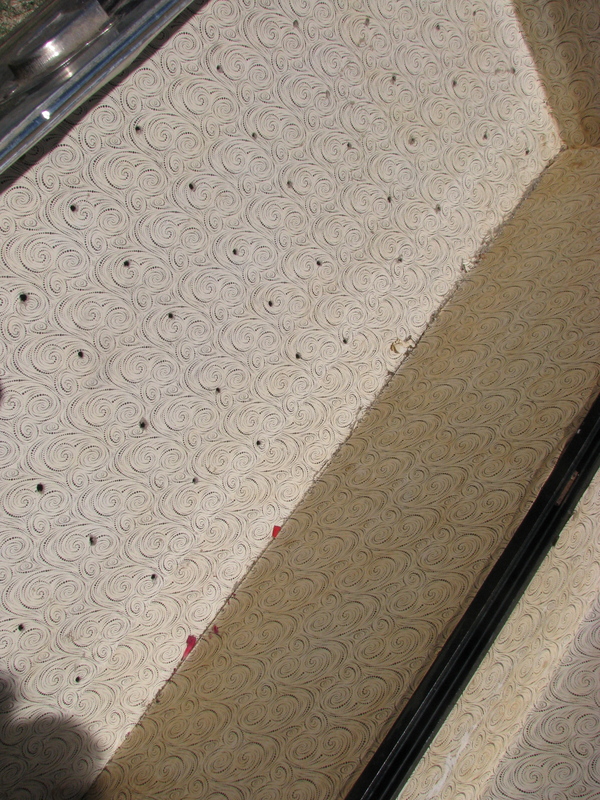 (Filled at the bottom of course so your dirt doesn’t escape.) 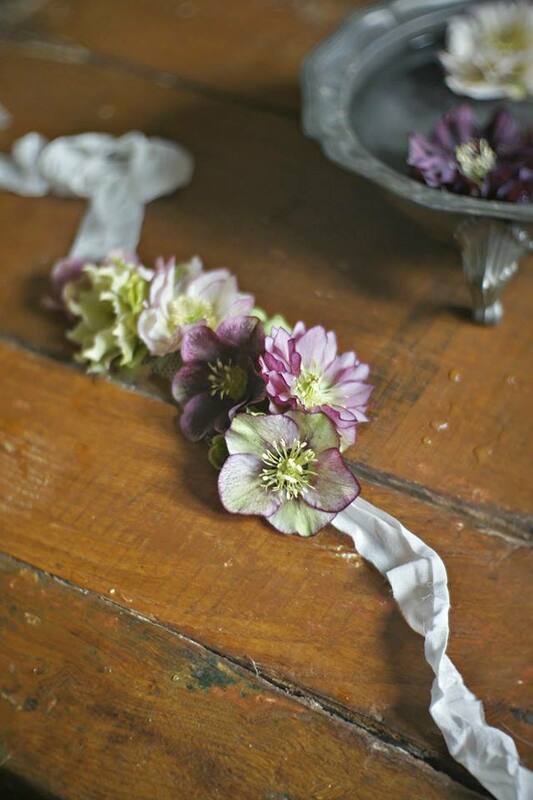 Love the Victorian period?? 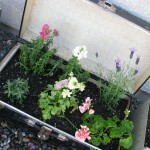 Find some old teapots or china to use as planters. Or simply go ‘treasure’ hunting and see where your heart leads you! 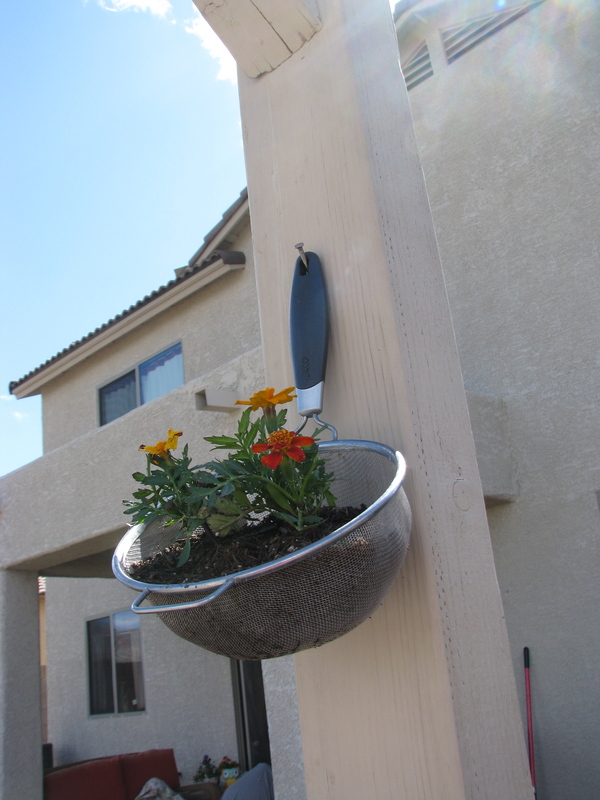 Our cost so far has been – $60 for the planters. 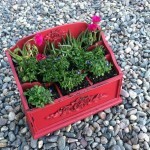 (This would have only been $30 but I found the wooden crates later on and just fell in love with them! The tops of the boxes we took off and they will be used for photo props for Spice Grove Designs!) 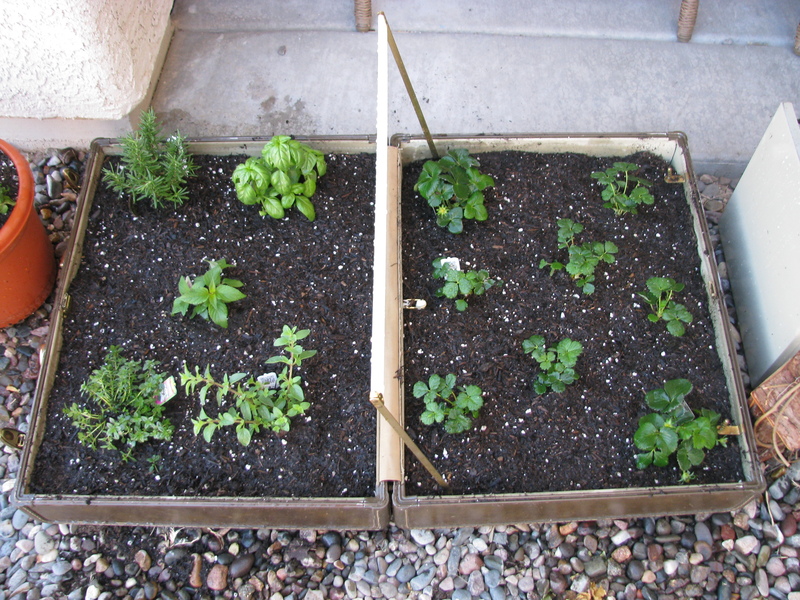 The plants, seeds and soil cost around $150, but would have only been about $60 if I only had to buy seeds and soil instead of the established plants. I was so thankful to get to do this with my girls not just to teach them about growing their own food and flowers, but to show them how creative we can be with reusing things!! 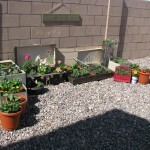 I hope you enjoyed a walk through our recycled garden and we’d love to see pictures of your gardens! Let us know what you think! 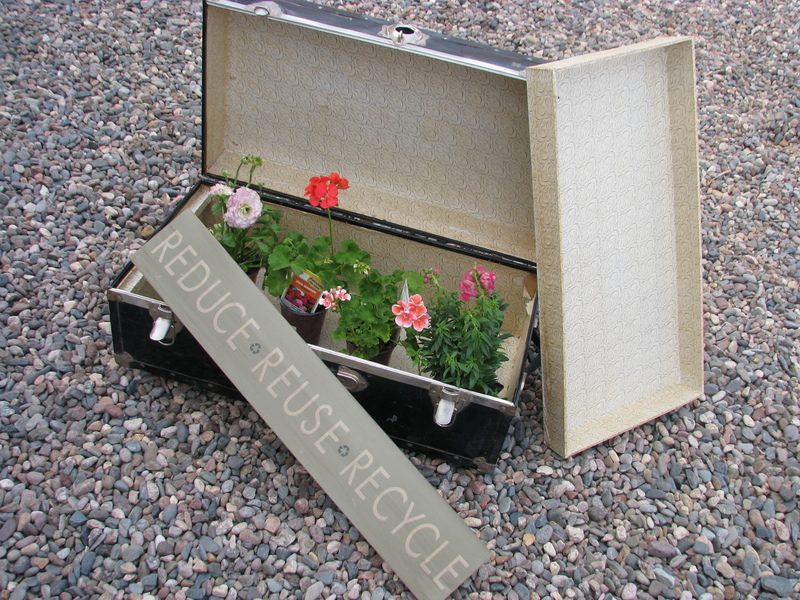 How are you recycling things in your garden? As always, blessings to you friends,and happy gardening! PS. 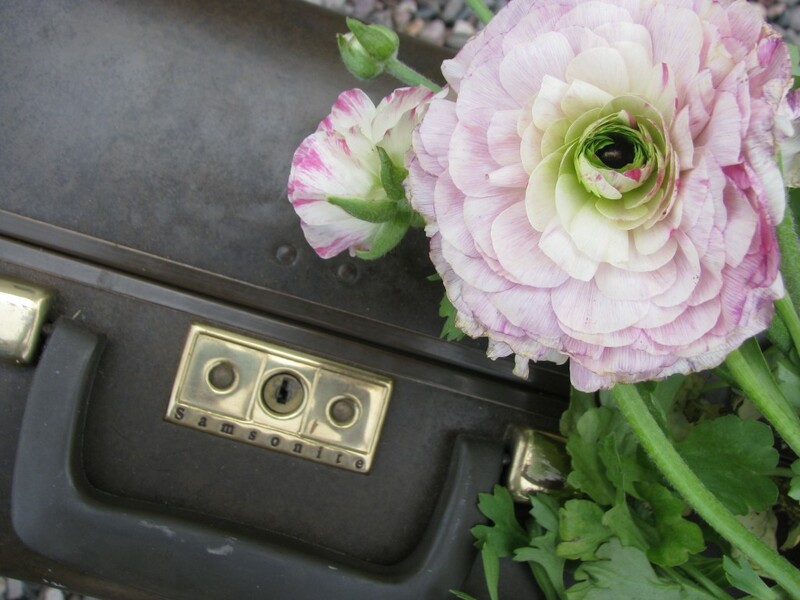 For some more inspiration from someone who is an actual gardener, make sure and check out our last post from our friend Emily at Fleuropean and the amazing difference she is making with her flowers! 1.Please tell us a bit about yourself and your business. Hi there! My name is Emily. 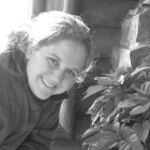 Thanks so much, Charlotte, for the opportunity to share my passion for flowers with you and your followers. How fun! I’m an ex-pat (originally from California) who uprooted everything shortly after graduating college to move abroad and start a new life with my (now) Dutch husband. About 5 years ago, we bought a rural farm nestled among the rolling hillsides of Belgium. Lucky for me, it came with grassland… some of which I chose to turn into my own little floral paradise. What started with one flower border quickly grew throughout the years to a decent-sized cutting garden full of roses, dahlias, sweet peas, larkspur, clematis, annuals, and perennials. I enjoy challenging myself each year by trying out new flowers, starting lots of plants from seed, and experimenting with unique varieties. 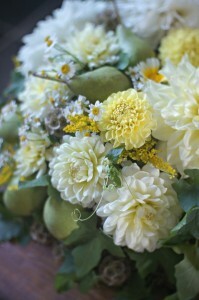 From gardening, a passion for flower arranging and floristry grew. 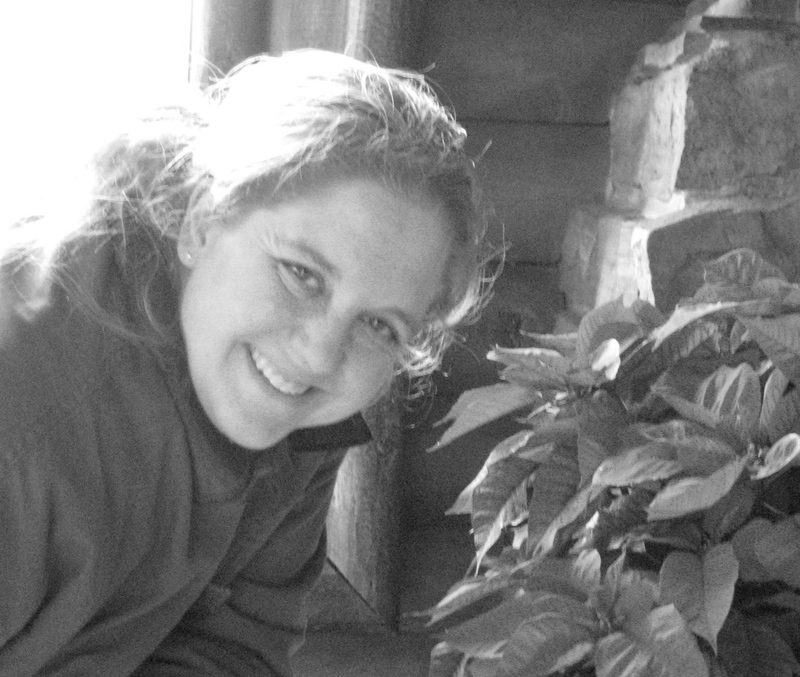 Now, here I am, still working hard in the garden and enjoying using the fruits of my labor in bridal bouquets, birthday bouquets and seasonal arrangements. 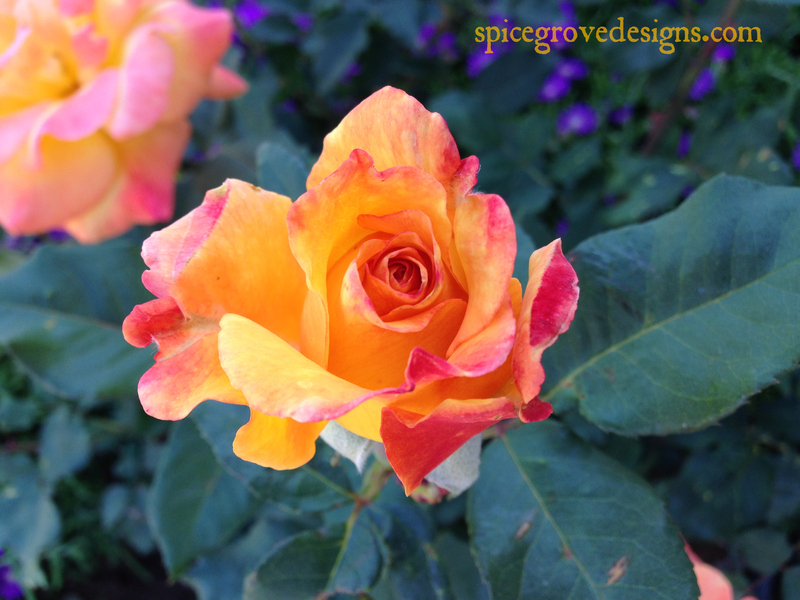 2.What makes your business different from other floral shops/gardens? The thing that makes Fleuropean most unique, I think, is my dedication to remaining personally involved in all aspects of my business. 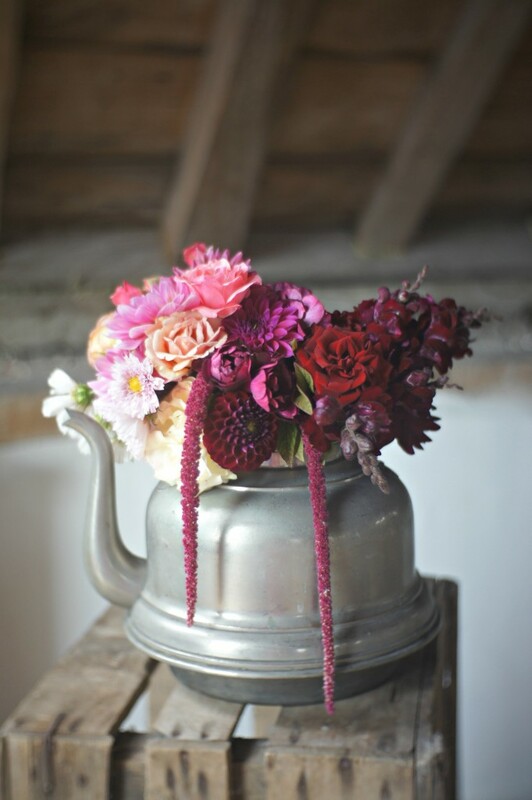 Especially here in Belgium, it’s hard to find a florist who grows their own flowers and strives to create natural-looking, freshly-picked arrangements. Without a little elbow grease, my business wouldn’t be what it is today. 3.What brings you joy/encouragement in your life and in creating your arrangements? Being able to work in the garden, get my hands dirty, and then see the beauty that nature and I are able to create together… that’s what gives me most pleasure. Working in harmony with Mother Nature gives me never-ending inspiration, encouragement, and joy. 4.Can you tell us more about the lonely bouquets program that you started? The Lonely Bouquet project grew (literally) straight from my garden. Faced with a surplus of flowers and the dreaded task of deadheading spent blooms, I looked for a way to use the excess flowers in a positive and productive way. After a bit of trial and error, I figured out a fun way to share the fun of flowers with locals… leaving little bouquets of fresh-cut flowers with “take me” tags attached scattered around local villages and cities. Hoping to get lots of others involved, I created an “International Lonely Bouquet Day” and invited anyone to join in. Before I knew it, there were over 1,000 people all over the world who had signed up to participate. The Lonely Bouquet community has continued to grow since, and we’re already planning our second annual International Lonely Bouquet day for Sunday, June 29th, 2014. Woo-hoo! Maybe some of you guys want to join in as well? 5.If you had to choose just one of your arrangements as your favorite you’ve created/made, which one would it be? Gosh… that’s such a tricky question. I guess my favorite arrangement would be the first of my “fruits and flowers” series, featuring pale pinks and strawberries. 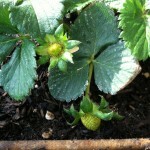 6.What does a day in your garden look like? Although it varies throughout the seasons, a day in my garden always starts out with a coffee in bed. After I’ve had my fill of coffee and sweets, I head outside to take a peek at what needs to be done. 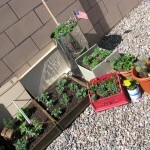 The springtime garden is all about working the soil, spreading compost, starting seeds, and weeding. During the summer and autumn, garden work mostly consists of weeding, deadheading, and flower cutting before heading back inside to condition the flowers and arrange them into bouquets. 7.Where can our readers find you?